Notes: Live is fast, fluid and flexible software for music creation and performance. It comes with effects, instruments, sounds and all kinds of creative features-everything you need to make any kind of music. 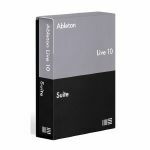 Create in a traditional linear arrangement, or improvise without the constraints of a timeline in Live's Session View. Move freely between musical elements and play with ideas, without stopping the music and without breaking your flow. In Live's Session View you can freely mix and match musical ideas without the constraints of a timeline. Getting ideas down is lightning fast, and it's the ideal place for improvisation. You can play MIDI and audio loops of different lengths in any combination, without ever stopping the music. The Arrangement View is where you can organize music along a timeline. Put musical parts in place and build sections of your song. Get into the details without losing sight of your musical goals-whether you're developing an initial idea or arranging a full track. Or you can record everything you do in the Session View into the Arrangement to improvise your way to a finished song. Whatever shape inspiration takes, Live gives you the means to seize it. Record hardware synths, software plugins, drum machines, guitars or any audio from the real world. You can now Capture MIDI notes after you've played them, turning your most spontaneous ideas (and accidents) into music. And there's Live's audio-to-MIDI features, which let you turn drum breaks, and melody or harmony parts into MIDI patterns that you can edit and reuse with your own sounds. One of the things that makes creating with Live so fluid is the ability to change the tempo and timing of any audio, in real-time, without stopping the music. We call this warping. Use warping to mix and match loops from a variety of tempos, fix timing errors in recorded performances, or radically reshape any audio into new sound design directions. Live's native devices are the foundation of sound design in Live, including wavetable, FM and physical modelling synthesis. Flexible synthesis architectures with intuitive interfaces make deep programming more accessible. And you get more out of your samples with Live's pair of sampling instruments, thanks to built-in slicing and warping capabilities, multi-sampled playback and much more. Live comes with the devices you need for sparking ideas and shaping your sound. Use Live's MIDI effects for creative manipulation of your compositions. Or use Live's audio effects to get the sound you're looking for: clean up your mix with precision tools, or make a creative mess with analog-modelled noise, distortion and saturation. Live is software without limits. Although it comes with everything you need out of the box, you can adapt it to suit your own unique needs and extend it to the world around you. From add-on Packs to your own custom devices via Max, Live can be tweaked to do almost anything you can imagine. Use Live to pull your show together. Control external hardware, integrate outboard effects or mixing desks. Improvise on your own, resample sounds in real-time, or process audio played by others. If you're playing with multiple music applications, our technology Link can keep multiple devices in perfect time over the same network. Create bolder sounds with Live's new devices. Stay in the flow with a multitude of workflow improvements. Do even more away from the computer with Push. Build your sound with a curated library. And get the unlimited potential of Max for Live, seamlessly built in. Meet Wavetable, Echo, Drum Buss and Pedal: new devices that mean colourful new sounds are possible with Live's instruments and effects. You'll find improvements to Live that help you stay in the flow at every stage of your creative process, whether you're getting ideas down, organizing your setup or editing the details of your music. Live 10 brings new functionality and new high-res visualizations to Push. Now you'll spend even less time with the computer-whether you're composing ideas, editing MIDI or shaping and mixing sounds. Latest Fruity Edition FL Studio software - with a lifetime of free updates! Notes: If you need the production power of FL Studio, but don't need to deal with audio recording or audio clips, then FL Studio Fruity Edition 20 will fit the bill. FL Studio Fruity Edition 20 gives you full access to a powerful piano roll editor, which lets you sequence and arrange your virtual instruments to your heart's desire. It also gives you access to FL Studio's powerful step sequencer, 18+ virtual instruments, and over a dozen built-in effects and processors. Add to that unlimited tracks, VST and DXi instrument support, and full automation capabilities, and you'll be hard pressed to find another electronic music production system that offers as much value as Image Line's FL Studio Fruity Edition. - Automate most interface and all plugin parameters by recording, drawing, spline-based automation curves, automation generators with formula-based control of links. - Record & play MIDI input recording from keyboards, drum pads and controllers. - Sequencing and arranging with pattern and linear workflow possible. - Synthesizer & effect plugin hosting VST 32 & 64 bit, DX and FL Native formats. - Open plugin standards - FL Studio supports all PC industry plugin instrument standards including VST, DX, Buzz and Rewire. This means you can sequence with your favourite plugins and applications. - Pattern or track sequencing - You choose, record your musical performances and ideas in the most logical way. FL Studio 20 can simultaneously function as a pattern and track based sequencer. Reuse patterns as Pattern Clips in the Playlist or record song-length sequences, as desired. - Step sequencer or Piano roll - Scoring tools include FL Studio's legendary Step-sequencer, one of the most advanced Piano rolls in any software studio, event and multipoint automation envelopes. FL Studio supports MIDI input, standard controller compatibility, and the ability to simultaneously control multiple instrument channels from separate controllers. - Determine your own project design - In FL Studio 20, you decide how your project will be laid out, including multiple 'Arrangements'. Unlike the competition, FL Studio 20's Playlist is a totally flexible and virtually unbounded workspace where - Note Pattern, Audio and Automation data can be arranged and edited to suit your creative ideas and preferred workflow. - The mixer - is about precision, control and flexibility. The mixer's tracks each hold up to 10 effects (VST or FL's proprietary format). To create sub-mixes or mixing chains of almost unlimited complexity, each mixer track can be routed to any other mixer track or the Master track. Sends provide the ability to sidechain inputs to multi-input effects plugins. Finally, each of the mixer tracks can be routed to any output on your audio interface, now that's flexibility. - Effects - What about effects? FL Studio 20 includes more than 40 effects spanning maximization, limiting, compression, delay, distortion, equalization (graphic & parametric), filtering, phasing, flanging, chorus, vocoding and reverb. These have you covered for the creative broad-brush effects, through to the minutia of the mastering process. 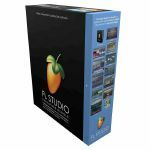 Latest Producer Edition FL Studio software - with a lifetime of free updates! Notes: Image Line FL Studio 20 is everything you need in one package to compose, arrange, record, edit, mix and master professional quality music. FL Studio 20 is the fastest way from your brain to your speakers. 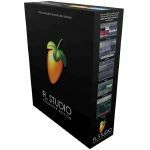 Image Line FL Studio 20 Producer Edition provides the highest level of program functionality for FL Studio. - Audio editing and manipulation including pitch correction, pitch shifting, harmonization, time-stretching, beat-detection & slicing, audio warping and standard audio manipulation (cut/paste etc). - Be hosted in other DAWs as a VST or connected through ReWire. - Live music performance including video effect visualization. - Mix and remix audio including apply real-time audio effects including delay, reverb & filtering. - Multi-track audio recording up to the limit of your audio-interface inputs. - Make virtually any sound - FL Studio includes over 30 software synthesizers covering acoustic/synthetic bass, electric guitar, multi-sampler tools including piano & strings, general sample playback and beat-slicing (With Rex 1 & 2 support). - Synthesis techniques - span subtractive, modelling, FM, RM, granular and additive. With the addition of FL SynthMaker you can further create & share your own FL instruments, effects & MIDI control dashboards without the need to write basic code. - Multi-channel audio inputs - With the ability to simultaneously capture all the inputs on your audio-interface, FL Studio has the flexibility to record a single vocalist, guitar or a full symphony orchestra. - Arranging audio - Audio can be arranged, with complete freedom in the Playlist. Features include the ability to host an unlimited number of audio recordings, time-stretching, pitch-shifting, beat-slicing, cropping, editing and the re-arranging of audio with only a few mouse clicks. - Determine your own project design - In FL20, you decide how your project will be laid out, including multiple 'Arrangements'. Unlike the competition, FL20's Playlist is a totally flexible and virtually unbounded workspace where Note Pattern, Audio and Automation data can be arranged and edited to suit your creative ideas and preferred workflow. - Effects - What about effects? FL Studio includes more than 40 effects spanning maximization, limiting, compression, delay, distortion, equalization (graphic & parametric), filtering, phasing, flanging, chorus, vocoding and reverb. These have you covered for the creative broad-brush effects, through to the minutia of the mastering process. Latest Signature Bundle FL Studio software - with a lifetime of free updates! Notes: FL Studio 20 Signature Edition is the most complete virtual studio. Image Line FL Studio 20 Signature Edition DAW software serves up all of the awesome production power of FL Studio Producer Edition, plus even more outstanding instruments and effects to spur your creativity right from the start. Like the Harmless software synthesizer, a fresh take on subtractive synthesis that sounds amazingly smooth and fat. And Gross Beat, a time and volume effect for creating gating, scratching and glitch effects. FL Studio 20 is a complete software music production environment, representing more than 16 years of innovative developments and our commitment to Lifetime Free Updates. Everything you need in one package to compose, arrange, record, edit, mix and master professional quality music. - Live music performance including video effect visualization. Mix and remix audio including apply real-time audio effects including delay, reverb & filtering. Notes: From cutting edge synths to studio-quality effects, KOMPLETE 12 SELECT is the perfect introduction to pro-grade sound for production or performance. This collection contains 14 premium instruments and effects - including MASSIVE, MONARK, and DRUMLAB - plus three Expansions. Each Expansions is loaded with genre-specific synth presets, drum kits, one-shots, samples, and loops. Created by top artists and sound designers, Expansions can be used in any DAW, and work with a range of Native Instruments products. KOMPLETE 12 SELECT may be bigger than ever, but getting up and running has never been quicker or easier. It's not easy to make sense of over 7,000 sounds. That's why KOMPLETE 12 SELECT comes with KOMPLETE KONTROL, a handy plug-in that makes light work of browsing through all your instruments and effects, whether using NI hardware or your mouse and keyboard. And since each instrument preset comes with an audible preview, you can audition all your sounds without waiting for extra plug-ins to load. Everything in KOMPLETE 12 SELECT comes ready-mapped to your NI hardware by the plug-in developers themselves, so getting hands-on with all your instruments and effects is as simple as connecting a KOMPLETE KONTROL keyboard or MASCHINE controller. And thanks to NKS, you get exactly the same experience with hundreds of plug-ins from more than 75 leading manufacturers. Notes: KOMPLETE 12 raises the bar for production, performance, and sound design in any genre. This collection contains more than 50 premium instruments and effects - including MASSIVE X, KONTAKT 6, and TRK-01 - plus 10 Expansions. Build just about anything you can imagine with KOMPLETE 12's two builder platforms. KONTAKT 6's advanced sampling and REAKTOR 6's flexible modular approach power thousands of innovative instruments and effects from NI, hundreds of leading manufacturers, and a growing community of users. Not ready to dive in at the deep end? Start making music straight away with comprehensive built-in libraries. From faithful hardware recreations, to cutting-edge designs that go beyond the capabilities of even the most out-there analogue gear, KOMPLETE 12 boasts 13 expressive, versatile synthesizers. Dive into FM synthesis with FM8, discover new textures with FORM, or explore the uncharted sonic worlds of the forthcoming MASSIVE X.
KOMPLETE 12's 20 sampled instruments range from unique pianos like UNA CORDA and THE GIANT to the contemporary pop sounds of SESSION STRINGS 2, and the traditional sounds of DISCOVERY SERIES: MIDDLE EAST. KOMPLETE 12's five dedicated percussion tools span everything from boom-bap beats to movie-trailer impacts. Tweak and randomize to your heart's content with POLYPLEX, build hard-hitting kits from your own sounds with BATTERY 4, or whip up some peak-time techno in no time at all with TRK-01. Sculpt, tweak, and tailor your sound with 15 studio-grade effect plug-ins - from REPLIKA's creative delays to the twisted-yet-classic sounds of MOD PACK, and GUITAR RIG 5 PRO's 53 unique effects and 17 amp sims. KOMPLETE 12 includes 10 Expansions - genre-specific sound packs loaded with synth presets, drum kits, one-shots, samples, and loops. Created by top artists and sound designers, Expansions can be used in any DAW and work with a range of Native Instruments products, including MASSIVE, BATTERY 4, and MONARK. It's not easy to make sense of over 25,000 sounds. That's why KOMPLETE 12 comes with KOMPLETE KONTROL, a handy plug-in that makes light work of browsing through all your instruments and effects, whether using NI hardware or your mouse and keyboard. And since each instrument preset comes with an audible preview, you can audition all your sounds without waiting for extra plug-ins to load. Everything in KOMPLETE 12 comes ready-mapped to your NI hardware by the plug-in developers themselves, so getting hands-on with all your instruments and effects is as simple as connecting a KOMPLETE KONTROL keyboard or MASCHINE controller. And thanks to NKS, you get exactly the same experience with hundreds of plug-ins from more than 75 leading manufacturers. Notes: KOMPLETE 12 ULTIMATE is the definitive instruments and effects suite for professional production, scoring, performance, and sound design. This collector's edition contains 100+ premium instruments and effects, plus the full SYMPHONY SERIES - COLLECTION, and more than 40 Expansions. KOMPLETE 12 ULTIMATE Collector's Edition contains an extensive set of sampled instruments for any scoring project, ranging from the rich orchestral libraries of SYMPHONY ESSENTIALS - COLLECTION, to the movie-trailer ready sounds of ACTION STRINGS and ACTION STRIKES, and innovative sound design tools like THRILL, KINETIC TOYS, and KINETIC METAL. From faithful hardware recreations, to cutting-edge designs that go beyond the capabilities of even the most out-there analogue gear, KOMPLETE 12 ULTIMATE Collector's Edition boasts 16 expressive, versatile synthesizers. Dive into FM synthesis with FM8, discover new textures with FORM, or explore the uncharted sonic worlds of the forthcoming MASSIVE X. Unique to KOMPLETE 12 ULTIMATE Collector's Edition are REAKTOR 6-powered favourites like FLESH, RAZOR, and SKANNER XT. KOMPLETE 12 ULTIMATE Collector's Edition contains 30 sampled instruments, from unique pianos like UNA CORDA, THE GIANT, and ALICIA'S KEYS to the pop-production sheen of SESSION STRINGS PRO 2, and the full DISCOVERY SERIES: COLLECTION. KOMPLETE 12 ULTIMATE Collector's Edition includes dedicated percussion tools for everything from pop and rock grooves and boom-bap beats to movie-trailer impacts. Recreate the sounds of yesterday with the full suite of Abbey Road drums, design your own kits with POLYPLEX and BATTERY 4, or create dramatic wide-screen tension with DAMAGE. Sculpt, tweak, and tailor your sound with 28 studio-grade effect plug-ins - from REPLIKA XT's infinitely tweakable delays to the retro-meets-futuristic EFFECTS SERIES - MOD PACK and CRUSH PACK, and a full suite of mixing tools included in the SOLID MIX SERIES, VINTAGE COMPRESSORS, and more. You also get 53 additional effects and 17 amp sims courtesy of GUITAR RIG 5 PRO. KOMPLETE 12 ULTIMATE Collector's Edition includes 20 Expansions - genre-specific sound packs loaded with synth presets, drum kits, one-shots, samples, and loops. Created by top artists and sound designers, Expansions can be used in any DAW and work with a range of Native Instruments products, including MASSIVE, BATTERY 4, and MONARK. It's not easy to make sense of over 90,000 sounds. That's why KOMPLETE 12 ULTIMATE Collector's Edition comes with KOMPLETE KONTROL, a handy plug-in that makes light work of browsing through all your instruments and effects, whether using NI hardware or your mouse and keyboard. And since each instrument preset comes with an audible preview, you can audition all your sounds without waiting for extra plug-ins to load. Everything in KOMPLETE 12 ULTIMATE Collector's Edition comes ready-mapped to your NI hardware by the plug-in developers themselves, so getting hands-on with all your instruments and effects is as simple as connecting a KOMPLETE KONTROL keyboard or MASCHINE controller. And thanks to NKS, you get exactly the same experience with hundreds of plug-ins from more than 75 leading manufacturers. KOMPLETE 12 ULTIMATE is the definitive instruments and effects suite for professional production, scoring, performance, and sound design. This collector's edition contains 100+ premium instruments and effects, plus the full SYMPHONY SERIES - COLLECTION, and more than 40 Expansions. Notes: KOMPLETE 12 ULTIMATE is the definitive resource for professional production, scoring, performance, and sound design. 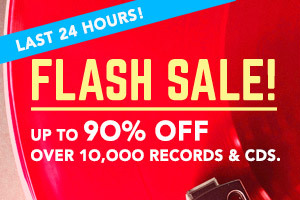 This collection contains 100+ premium instruments and effects - from cutting edge synths to symphonic sample libraries - including MASSIVE X, THRILL, and SESSION GUITARIST - ELECTRIC SUNBURST, plus 20 Expansions. KOMPLETE 12 ULTIMATE contains an extensive set of sampled instruments for any scoring project, ranging from the rich orchestral libraries of SYMPHONY ESSENTIALS - COLLECTION, to the movie-trailer ready sounds of ACTION STRINGS and ACTION STRIKES, and innovative sound design tools like THRILL, KINETIC TOYS, and KINETIC METAL. From faithful hardware recreations, to cutting-edge designs that go beyond the capabilities of even the most out-there analogue gear, KOMPLETE 12 ULTIMATE boasts 16 expressive, versatile synthesizers. Dive into FM synthesis with FM8, discover new textures with FORM, or explore the uncharted sonic worlds of the forthcoming MASSIVE X. Unique to KOMPLETE 12 ULTIMATE are REAKTOR 6-powered favourites like FLESH, RAZOR, and SKANNER XT. KOMPLETE 12 ULTIMATE contains 30 sampled instruments, from unique pianos like UNA CORDA, THE GIANT, and ALICIA'S KEYS to the pop-production sheen of SESSION STRINGS PRO 2, and the full DISCOVERY SERIES: COLLECTION. KOMPLETE 12 ULTIMATE includes 20 Expansions - genre-specific sound packs loaded with synth presets, drum kits, one-shots, samples, and loops. Created by top artists and sound designers, Expansions can be used in any DAW and work with a range of Native Instruments products, including MASSIVE, BATTERY 4, and MONARK. It's not easy to make sense of over 45,000 sounds. That's why KOMPLETE 12 ULTIMATE comes with KOMPLETE KONTROL, a handy plug-in that makes light work of browsing through all your instruments and effects, whether using NI hardware or your mouse and keyboard. And since each instrument preset comes with an audible preview, you can audition all your sounds without waiting for extra plug-ins to load. KOMPLETE 12 ULTIMATE is the definitive resource for professional production, scoring, performance, and sound design. This collection contains 100+ premium instruments and effects - from cutting edge synths to symphonic sample libraries - including MASSIVE X, THRILL, and SESSION GUITARIST - ELECTRIC SUNBURST, plus 20 Expansions. KOMPLETE 12 raises the bar for production, performance, and sound design in any genre. This collection contains more than 50 premium instruments and effects - including MASSIVE X, KONTAKT 6, and TRK-01 - plus 10 Expansions. Notes: Work better, faster. Studio One 4 Artist is designed for ease of use without sacrificing effectiveness. It seamlessly combines the time-tested recording studio model with today's beat-oriented production process, so musicians of all genres can bring their musical ideas to sonic reality - quickly and easily. Studio One doesn't dictate a workflow but provides advanced features so musicians can follow their own musical path. In addition to the wealth of flexible tools for all types of creative musicians, the next-generation Impact XT and Sample One XT are exciting new virtual instruments for EDM and hip-hop producers. These aren't just "instruments," but powerful, complete production environments - auto-slice, dice, sample, de-construct, and trigger synched loops with an intuitive workflow. And when you're creating rhythm tracks for any genre, the new Patterns and companion Drum Editor bring step sequencing and drum machine-style music creation into the 21st century. There's a very good reason why so many musicians have switched to Studio One from older, more rigid programs. Built on a modern foundation that's not bogged down by legacy code, Studio One Artist provides an efficient, creative companion from initial inspiration to final export. Its efficient, single-screen interface houses an unlimited number of tracks, intuitive editing tools, and advanced virtual instruments - you spend your time creating music, not wondering what to click next. The 32-bit mix engine is state of the art, while the smooth, analogue, superior sound quality of the virtual instruments comes from proprietary techniques that provide much higher controller resolution. The reason why Studio One resonates with musicians is simple: PreSonus listens. As with previous versions, many new features in Version 4 are the direct result of user feedback. Add a comprehensive and easy-to-use feature set, full integration with Notion for superb notation, carefully curated content, a comprehensive set of plug-ins, advanced step sequencing, unified hardware control with the FaderPort series of hands-on controllers, and much more - it's no wonder that Studio One continues to gain new followers every day. Notes: Work better, faster. Studio One 4 Professional is designed for ease of use without sacrificing effectiveness. It seamlessly combines the time-tested recording studio model with today's beat-oriented production process, so musicians of all genres can bring their musical ideas to sonic reality - quickly and easily. Studio One doesn't dictate a workflow but provides the tools and flexibility for musicians to follow their own musical path. Songwriters prototyping a song will love the new Harmonic Editing features, which allow Instrument and Audio Tracks to follow chord progressions dynamically. For EDM and hip-hop producers, the next-generation Impact XT and Sample One XT virtual instruments are complete production environments - auto-slice, dice, sample, de-construct, and trigger synched loops with an intuitive workflow. Patterns and a new Drum Editor bring step sequencing and drum machine-style music creation into the 21st century. Studio One is also a complete mastering suite, including DDP import/export for CD duplicators and digital delivery for online streaming and publishing. There's a very good reason why so many musicians have switched to Studio One from older, more rigid programs. Built on a modern foundation that's not bogged down by legacy code, Studio One provides an efficient, creative companion from initial inspiration to final master. Its efficient, single-screen interface houses an unlimited number of tracks, intuitive editing tools, advanced virtual instruments, mastering, and video player - you spend your time creating music, not wondering what to click next. The 64-bit double-precision mix engine is state of the art, while the smooth, analogue quality of the virtual instruments comes from proprietary techniques that provide much higher controller resolution. That's why Studio One just plain sounds better. The reason why Studio One resonates with musicians is simple: PreSonus listens. Many new features in Version 4 are the direct result of user feedback, including AAF import/export so users can bring song data from their old DAW into Studio One. Add the most flexible arranging tools of any music program, full integration with Notion for superior notation, over 20 GB of carefully curated content, analogue console emulation, advanced step sequencing, unified hardware control with the FaderPort series of hands-on controllers, and much more - it's no wonder that Studio One continues to gain new followers every day. Work better, faster. Studio One 4 Professional is designed for ease of use without sacrificing effectiveness. It seamlessly combines the time-tested recording studio model with today's beat-oriented production process, so musicians of all genres can bring their musical ideas to sonic reality - quickly and easily. Notes: Reason is easy to get started with, yet as deep as you want it to be. And it comes fully loaded with the instruments, effects and sounds your music making need. Create, compose, mix and finish your music-Reason will help you along the journey, from inspiration to mixdown. New sounds and new gear pave the way for new music, and Reason 10 is here with a rackload of new synths, instruments, samples and more. Grain and Europa: two massive, brand new synthesizers. Klang Tuned Percussion, Pangea World Instruments, Humana Vocal Ensemble: three new live-sounding organic instrument devices. Radical Piano: a top-notch acoustic piano. Synchronous: creative modulation device. Loop Supply and Drum Supply: a multi-gigabyte infusion of cutting-edge drum loops and samples. What music will you create? Europa was created for huge, epic sounds and oh boy, does it deliver... From big stacks of buzzing sawtooths to shimmering, glitched-up sonic explorations, Europa has you covered. To call it a wavetable synth wouldn't be wrong, but it's so much more than that. Apply a wide range of modulation to the waveform itself, to start with. Add advanced spectral filtering, harmonics processing and even draw your custom waveforms. And the best part: despite its deep synthesis powers, it's still surprisingly easy to use. Get granular with your samples! The Grain synthesizer opens up the world of granular synthesis for your creative use. Drop any sample into Grain and explore the endless sonic variations you can create with Grain's selection of playback algorithms, ultra-flexible modulation, routing and effects. With immense sonic power and an inviting interface, Grain is the easy-to-use sonic lab that turns your samples into grains and your grains into music. Update your sound with this multi-gigabyte injection of cutting-edge loops and drum samples made to deliver up-to-date pop. electronic and hip hop sounds for Reason. Get creative with a huge selection of patches for Reason's Kong drum machine and Dr Octo Rex loop player. The premise is simple. The results are stunning. Three basic pianos paired with the technology to make an infinite number of your own. Based on a custom blend between sampling technology and physical modelling algorithms, Radical Piano affords songwriters, producers, and sound designers an unprecedented level of control to craft a realistic piano that is 100% unique. Bring your music to life with Synchronous' modulation effects. Create quick sidechain effects or draw your own LFO curves to control filter, delay, reverb, distortion and level. Make your sound evolve, change and loop over time. Notes: The biggest Reason update. Ever. - 4 GB free system disk space required, plus 8 GB for optional content. Additionally, program may use up to 20 GB scratch disk space. Notes: This is a discounted upgrade for Reason Essentials/Adapted/Limited owners. Get your download today! Set your creativity free with the full version of Reason. Version 9 adds the new Player devices: Player devices. Scales & Chords, Note Echo and Dual Arpeggio. Boost your sound with the full selection of instruments and effects in Reason. And tap into the 1000 new cutting-edge synth sounds from professional sound designers in Reason 9. Polish your recordings to perfection with Reason's full set of Mixing tools and the new Pitch Edit introduced in Reason 9. It doesn't just sound good. It sounds Reason time-stretch good! Delivering on our #1 feature request, VST plugins are now supported in Reason. The workflow you know and love, coupled with any plugin you want. VST plugins will be right at home in the Reason rack. Drag & Drop from the browser, use CV with your plugins, add Players, put them in Combinators with Reason's own devices or Rack Extensions - all the things you expect when working in Reason! Add players to your favourite Reason instruments and unleash a torrent of musical ideas! The players adds a musical twist to what you are playing and the results are nothing short of magic. The scale aware Scales & Chords Player will filter and remap your playing to always be in key. With chord mode, you'll be playing scale-perfect one-finger chords. You never knew you were this good! The name says it all. Note echo can create a trailing echo of your playing in any tempo or intensity you wish. Enable transpose create a layer of falling or rising notes. Two powerful polyphonic arpeggiators in one device. They both have traditional arpeggio settings, but also a pattern mode where you can create intricate rhythmic, polyphonic patterns from what you are playing. Best of all, each Player can be combined with the other, allowing for endless experimentation. Feed Note Echo through Scales & Chords, create an arpeggio of chords in exotic scales. What will you do? Polish your vocal recordings to perfection with the new Pitch Edit mode. Fine tune pitch and timing with the same transparency and quality as Reason's famous time stretch. Inspire your music making in sound with 1000 new high quality synth patches from leading sound designers. 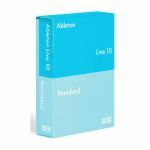 Reason 9.1 adds Ableton's Link technology to Reason. Jam with friends on Link enabled apps on desktop or iOS. Or bring the sound of your favourite iOS apps to your music. Notes: Start making music with Reason Intro and get stunning results with ease. Reason Intro is easy to get started with, yet as deep as you want it to be. The included set of instruments, effects and sounds is everything you need to get started making music. Then polish your work to perfection with Reason Intro's state-of-the-art recording and mixing tools. Create, compose, record and finish your music in Reason Intro. Reason Intro comes with everything needed to create amazing music. An assortment of Reason's legendary instruments and effects, paired with Reason's straightforward recording tools and studio-grade mixing tools makes Reason Intro the perfect choice for aspiring music-makers with limited budgets but sky-high ambitions. At the heart of Reason Intro is a virtual rack that builds itself as you create your song. Reason Intro's legendary instruments and effects cover every need from acoustic and organic to electronic and synthetic. As you build your rack, everything is automatically connected and routed for you. If you want to dive deeper, turn the rack around and you'll find yourself in cable heaven! Craft the sound you are after by routing audio and control voltage freely between devices in the rack. Your imagination is the only limitation to what you can build. Capture your musical ideas in Reason Intro's powerful sequencer. Record and edit audio, MIDI or automation with powerful recording and editing tools. Always in sync with your flow, forever adapting to you and your working methods, Reason Intro simply gets you there faster. Record first and pick your tempo later with Reason Intro's renowned time stretch. Non-destructively correct the timing of your audio recording with Slice Edit. Or rework, resample or reshape your recordings into something completely new. When you're looking for even more creative options, plugins come to the rescue. Expand your virtual rack with new, inspiring instruments and effects created by developers around the world-from modern effects to vintage instruments. Reason Intro supports VST plugins and Reason's own Rack Extension format. Rack Extensions are full Reason rack citizens, giving you the same fully integrated experience as when using any of the included synths, effects and utilities. VST plugins are right at home in Reason Intro's rack. Drag & Drop from the browser, use CV with your plugins, add Players, put them in Combinators with Reason Intro's own devices or Rack Extensions - all the things you expect when working in Reason! And if you feel the need to take your productions even further, upgrade to the full version of Reason at a discounted price and create music with unlimited audio and MIDI tracks and all of Reason's powerful instruments and effects. Reason Intro's massive 3.7 GB sound bank comes with everything you need to get started with your music making: synth sounds, sampled instruments, drum kits, loops and effects and more. Notes: Cubase Artist offers a range of proven editing and sequencing tools based on the same core technologies used and appreciated by musicians around the world. With an easy-to-use interface, unsurpassed performance and inspiring instruments and effects, Cubase Artist remains unmatched in its price range. This Cubase version is simply the perfect choice for talented newcomers and seasoned musicians. Cubase 10 delivers many impressive new features in a remarkably powerful software package. It includes many new tools to enhance your creativity and speed your workflow. There is also a new, modern user interface and enhanced audio quality. Cubase 10 makes music production more inspiring, intuitive and flexible than ever before. Notes: With world-class virtual instruments, rich audio effects, and powerful tools for recording, editing, and mixing audio and MIDI tracks, Cubase Elements transforms your computer into a complete production system. Notes: Cubase Pro condenses almost three decades of Steinberg development into the most cutting-edge DAW anywhere. Used by star producers and musicians for composing, recording, mixing and editing music, Cubase Pro combines outstanding audio quality, intuitive handling and a collection of highly advanced audio and MIDI tools. Whether you record an orchestra, a huge live rock show, or a band in the studio, Cubase Pro is sublime in every sense of the word. Notes: The Media Pack is an addition to Steinberg software products. It provides users with a physical installation disc, which is especially useful for customers who experience slow internet connection speeds. There is no license included. Notes: The USB-eLicenser (formerly Steinberg Key) is a copy protection unit (sometimes called dongle) which is needed to use Steinberg's software range. With the host applications Cubase, Nuendo and WaveLab, the USB-eLicenser is already included in the product package. The USB-eLicenser is also required to run Steinberg VST instruments, but is not included in the product boxes and must be purchased separately if no USB-eLicenser/Steinberg Key is already present on the system. The USB-eLicenser is actually a tiny computer which stores licenses for Steinberg products, and is connected to a USB port on your computer. All current Steinberg products that use a copy protection device use exactly the same system. The Steinberg copy protection system allows the storage of several licenses on the same USB-eLicenser. Licenses can also be transferred between USB-eLicensers with certain limitations. This can be very useful, for example in the unlikely event of a Steinberg customer wishing to sell a product.